Lt. Michael Holton, Matt Greeson and Sgt. Damien Tige St. John at Police Open House is a picture, with genre photograph and group portraits. It was created on Sunday, October 2, 2016. Worthington Division of Police is the Creator. Worthington City Manager Matt Greeson (in mask) interacts with Worthington Police Lt. Michael Holton (arms folded) and Sgt. 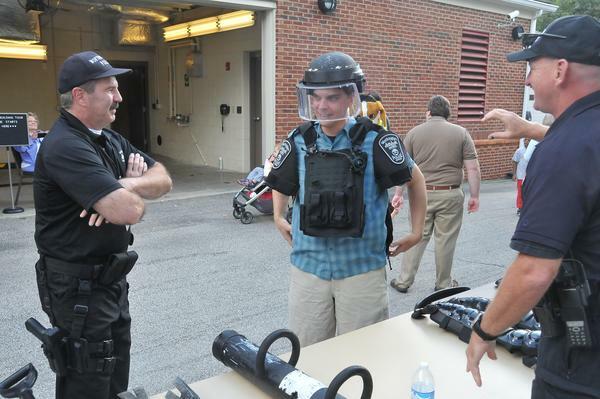 Damien Tige St. John while trying on police gear during an open house hosted by the Worthington Division of Police. It covers the topics police, festivals and education. It features the people Michael Holton, Damien Tige St. John and Matt Greeson. It features the organization Worthington Division of Police. The Worthington Memory identification code is cow0106. This metadata record was human prepared by Worthington Libraries on August 12, 2018. It was last updated August 22, 2018.